Bane has some skill, but his hits don’t hurt Mammoth at all, and the big guy is fast, too. He takes Bane down in just a couple of exchanges, multiple hits, but probably the equivalent of a couple of in-game turns. Batman assigns the Team the task of investigating the sudden cessation of venom shipments from Santa Prisca. They go in covertly, using Miss Martian’s bio-ship. 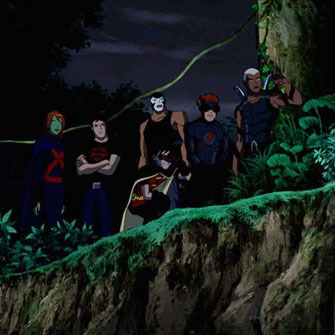 Aqualad disables the island’s sensor net and the team uses camouflage mode on their uniforms — most likely an in-game convenience rather than an ability the characters have to “pay” in order to use. Although they try to avoid detection, Robin goes off on his own, and Kid Flash, looking to corral him, trips right into the middle of a shootout between Bane and Kobra’s cultists. This is either a bad die roll on the part of Kid Flash’s player (and some improv from the Game Master) or a case of a GM-controlled setback, probably awarding the team or Kid Flash’s player some compensation. The Team almost immediately falls into bickering about who is in charge, with Robin and Kid Flash primarily vying between them. It makes matters difficult, as Robin tends to go off on his own to get things done, Kid Flash following in his wake, and the rest of the team left without direction. When Bane decides to take matters into his own hands (another complication) and the Team’s communications are jammed (yet another complication), Aqualad is forced to take command. Mammoth and the Kobra cult attack, and Sportsmaster detects the camouflaged Miss Martian, hurling a proximity detonating javelin at her. He has Miss Martian link the team telepathically, a superhero team maneuver that has become a classic since the X-Men regularly began using it; a “team link” is a common stunt or capability for telepathic characters in superhero RPGs, although it varies in terms of providing benefits beyond just ease of communication. It does nicely reflect the level of “table talk” that goes on for an RPG, providing an in-game reason for the heroes to cross-talk as much as is common for players. The Team makes a strategic retreat from the venom factory and agrees the keep Aqualad in charge. They overcome Bane, who intended to sacrifice the young heroes in order to draw in their Justice League mentors. Then they return to the helipad with a plan to take on Kobra, Sportsmaster, and their minions. Better prepared, they quickly take down most of the bad guys, although Kobra proves more than a match for Robin, and Sportsmaster escapes with the improved venom shipment. Unfortunately for him, the helicopter is mined with Bane’s explosives and Sportsmaster barely escapes before the ‘copter crashes in the factory. Left with nothing to win, Kobra withdraws and disappears. Forced to explain the scenario to Batman, the team is surprised to earn his compliments for a job well done, considering the circumstances. Fighting vs. Strength: There is often value to be had in distinguishing between a character’s able to hit (combat skill) or to hit hard (strength or damage capability). Some games don’t distinguish between them: the Marvel Super-Heroes Adventure Game, for example, uses Strength as the active ability in close combat, so strong heroes are good unarmed fighters, unless there’s some reason for them not to be. Special abilities like Martial Arts influence this, substituting Agility for Strength. Other games separate the two traits and may even further sub-divide them, while still others don’t differentiate at all, and look to measure things other than strength or skill, focusing on motivation, drive, or even overall importance to the plot. Complications: Comic book stories often come with a lot of unexpected circumstances and dramatic reversals: Kid Flash’s slip-up, Bane jumping the gun (and later betraying the Team), the signal jamming, and so forth. In some cases, this may just be the GM choosing to have inopportune things happen, or the dice not favoring the players and creating problems, but some systems choose to integrate complications and provide mechanical guidelines for both implementing them and for balancing their effects by giving the players some resource or advantage so they can more easily bounce back from the complication. Conflict: A big element of this story is the conflict within the team about leadership. Some game groups might have difficulty portraying this conflict: Good role-players can separate their own feelings from those of their characters and play out a conflict, but others might have trouble, or just not find that kind of role-playing fun. At least part of it is divorcing player and character knowledge: After all, if Aqualad’s character sheet shows he’s got the Leadership trait (or whatever other abilities make him a good leader), why not just put him in charge? Rather than the players going “So, who has Leadership and the highest Intellect?” and settling things amongst themselves, why not ask “So, which characters want to be leader the most?” (knowing they’re not necessarily best-suited for the job) and encouraging some role-playing to see what happens? Teamwork: Teamwork is a significant lesson of this episode, as it has been in prior episodes, and a good superhero game offers benefits for teams learning to work together. Some of it may just be players taking advantage of opportunities, but it can also come in the form of shared team resources, or helpful actions. In Icons, for example, maneuvers to gain advantage can then give activations of that advantage to other characters. Similarly, Mutants & Masterminds has a team check mechanic for characters giving a leader or primary character a bonus. Planning: A good deal of “planning” in superhero fiction is retroactive. Take the disabling of Sportsmaster’s helicopter: When the Team needs a delaying action to deal with Bane and come up with the plan, Sportsmaster is unable to leave the island. “Sabotage. Robin?” he asks. “Undoubtedly,” Kobra replies. Did Robin’s player knowingly sabotage the ‘copter earlier in the game, or did he later conclude the team needed time and use an in-game mechanic to sabotage the helicopter retroactively, working it into the story as something he “would have done”? Some RPGs play around with plot using abilities like Preparedness or a game resource allowing players to retroactively change details. Both Icons and M&M do so with advantage and hero points. GUMSHOE uses Preparedness in a similar way, which the Timewatch RPG turns into literal retroactive changing of history. Next: Superboy needs a mentor, but is this a job for Superman? The Team faces its greatest challenge yet when they confront the android Amazo, a being with all of the Justice League’s powers. The requirement of players to have to work with an evil NPC is also a trick I like to throw into the game, getting players to figure out just when the evil character might pull a stunt like Bane did can be quite the interesting rp device (of course it can also paralyze players into inaction, but many things can).